Ever tried chanting the runes? Ever wondered how they are connected to the cosmos and the quantum realm of reality? Most people will come across the runes by picking up a book or reading a guide as to which rune means what, what effect each one is supposed to have and run off chanting, tracing, experimenting with them and trying desperately to make them ‘work’ with little if any success. More often than not, this is simply due to the lack of proper actual know how. The runes were revealed to Odin, who then inscribed them upon all things in creation. They were subsequently taught to mankind by Heimdall, to the Vanir Gods and Goddesses by Odin himself and used on large as well as small scales of creation ranging from the gods cursing primordial giants, to winning the heart of one’s love by humans. One can think of runes as keys that unleash energies used to encode events, realities, perceptions … Uttering or chanting the runes (rather unleashing their effects) is traditionally called Galdr (which is an Old Norse word meaning incantation). Odin reveals 18 such Galdr chants in the Hávamál giving him powers such as the ability to withstand fire, to raise the dead and so forth, whereas humans were able to use Galdr to force marriage (see Skírnismál), enable childbearing (see Oddrúnargrátr) and much more. In order to use High Galdr (the Galdr of the Gods such as Odin uses), one has to master the Self, awaken the spark within, gain understanding of the layers of reality and, more specifically, the effects of each rune upon every one of those realities. Unlike other ‘arts’ in similar fields, Galdr is very much akin to a science, providing one ability to unleash specific effects according to specific ‘rules’ or formulae. It is for all intents and purposes a process of learning the ‘Science of the Gods’. The books of the High Galdr series aim to teach you all the skills and provide the know how needed to expand the Self to the point where you can learn to unleash proper High Galdr. 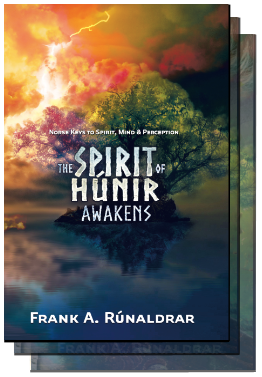 The series starts off by focusing on mastering the Self and then gradually moves onto the mastery of the runes and their various applications. They are written to be totally stand alone as well as build on the knowledge base and skill set from one to the other. In other words, feel free to pick up any of them in any order you wish. 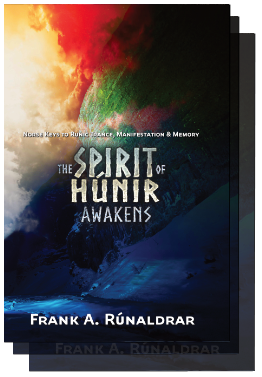 The Spirit of Húnir Awakens (Part 2) - The Norse 'Holy Grail' Now Available - Secrets of Memory, Odin's Munni Raven, the Minni of the Self, using actual Intent, reclaiming your mind and energy, runic trances AND least but greatest: the practical and theoretic secrets of the most guarded Norse Mystery: that of the Óðrerir (Norse 'Holy Grail')!